Seurat sur Fleet: could London’s lost river flow through St Pancras once more? A group of young workmen take their leisure by the River Seine, in an industrial suburb west of Paris. It’s the best-know depiction of riverine ease anywhere in art. You can see it, Georges Seurat’s Bathers at Asnieres, in the National Gallery in London. Is it possible we might see a real, 21st Century, recreation of that scene, not too far from where the painting hangs? In 2013 Richard Gooden of the 4orm practice won the Forgotten Spaces competition run by the Royal Institute of British Architects. In his entry Gooden transposes Georges Seurat’s Bathers to Pancras Road, London, setting them in a clear and sparkling River Fleet. Today the very idea of setting workmen from, say, the building work around the transformed Kings Cross and St Pancras area here, while the Eurostars power past to make a direct link to Seurat’s Paris, would seem to be pure imagination, with or without the funny hats. The only thing flowing past the church, dedicated to the memory of the Roman Christian martyr, is unrelenting London traffic. There is no River Fleet here or anywhere else in built-up London, nor has there been for well over a century. Or no river Fleet visible above ground, to be more precise. The truth is that London’s greatest lost river never stopped running. It continues making its very orderly way, roughly along its former route, from Hampstead to the Thames at Blackfrairs, but deep underground, relegated to the function of a sewer. It is there now, somewhere beneath Pancras Road. And it is from there where Gooden and 4orm said it should be rescued. 4orm’s winning entry, Fleeting Memories, was shown at the Royal Institute of British Architects’ exhibition at Somerset House in the autumn of 2013. The competition was a call for proposals to renovate, re-imagine and regenerate rundown sites around London. But it was the revival of the forgotten River Fleet at St Pancras Gardens which most attracted the judges. 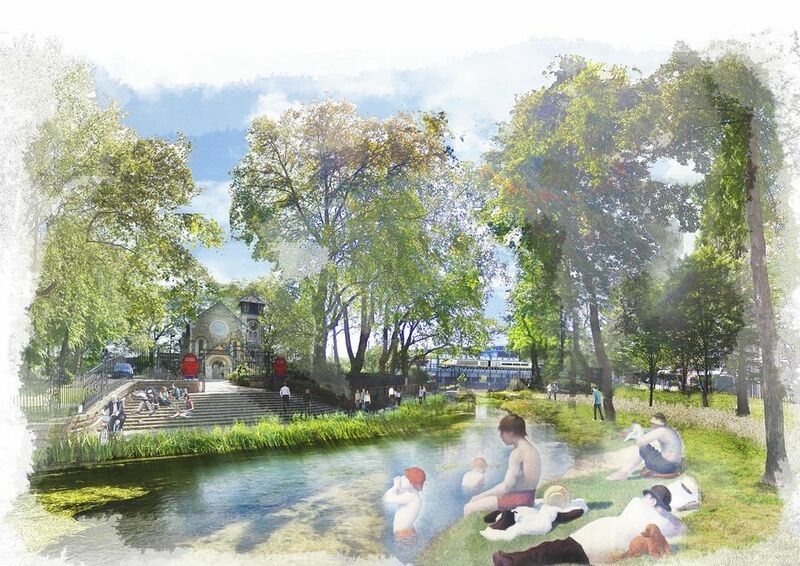 4orm’s Fleeting Memories proposal would involve closing part of the Pancras Road and replacing it with a park to accompany the restored river. Could it happen? There is so much transformation around King’s Cross, so much redevelopment of former railway land, so much vim and vigour. Would it be so hard to add on this simple piece of engineering, and recall the area’s once rural past? The new River Fleet could be fed from water from boreholes drilled into London’s chalk aquifer. No new technology is required. The water should be clean enough for Seurat’s swimmers. The River Fleet is one of the world’s shortest and greatest vanished rivers. It is the tantalizing lost manuscript of our aquatic environment. In cultural terms, a Beethoven Sonata with only the first few bars remaining. Or an early Shakespeare sonnet, reduced to the opening lines. Or a ghostly Vermeer, with a few tentative brushstrokes on the top left of the canvas. You can walk its course comfortably in a day, or a long summer afternoon and evening, starting at Hampstead Underground Station, and strolling over to Hampstead Heath, from where there is a view deep down into London, and where the river’s feeder streams still run briefly, clear and clean, above ground. But today London’s second river, once so familiar, and latterly so despised, has disappeared along its entire length. There is one shining model, a successful scheme in North America which has helped regenerate a city centre. In the 1970s the heart of Providence, Rhode Island, was a mess, its jewellery and silverware industry in decline, its streets a peril. The lower Woonasquatucket and Moshassuck rivers—and the upper Providence River, into which they flowed—were hidden beneath an asphalt wasteland. In 1983 the city began an ambitious scheme to unearth its rivers, reroute them through the centre and make a civic feature out of them. Today a dozen low, arched bridges span the reborn rivers, flowing through city centre parkland, bordered by walkways. On summer nights the new aquatic feature is given over to WaterFire, an installation of flaming torches and music on the rivers, which hints at mediaeval Venice. Richard Gooden told disegnodaily.com that while researching the project he and his colleagues had come across some early 19th-century engravings that showed people bathing in the Fleet, in a slightly bucolic landscape. The area, he said, was “underused and forgotten”. Nearby was the massive King’s Cross redevelopment site, home of Google and other big players. Gooden said the practice wanted to provide another resource for that coming dense population. He said he thought the scheme was “ambitious but achievable.” “But it is easily possible to imagine what this place would be like…a congenial place to be. Previous PostGerman postal service’s electric delivery van goes mainstream	Next PostLouvre Abu Dhabi, opening November 2017, adds culture to short break appeal.